Interview Training Materials are designed for trainers to teach employees how to master interviews and further their career. Develop employees’ knowledge of understanding the interview process, how to prepare for questions, what to expect after an interview, sealing the deal and much more! Seeing is Believing This sample manual to teach Mastering the Interview to Further your Career is in MS Word format. Do you know the benefits of establishing a positive and professional self representation during an interview? Promotions depend on preparation and practice- but knowing what to prepare and how to practice is essential. Mastering the Interview Training Materials holds the knowledge of the qualities that employers desire. Expanding your expectations of the questions that will be asked during an interview can give you an incredible advantage over other applicants for the position. Even more, being able to demonstrate your unique skills through a well-articulated answer to interview questions will put you in the lead. 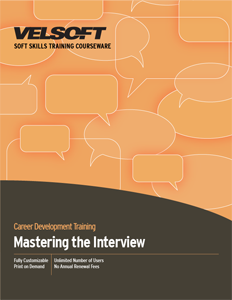 Our training materials for Mastering the Interview to Further Your Career give instructors the ability to effectively engage students with informative and relevant interview examples. Our fully customizable training materials teach students a variety of methods to promote better self-expression skills, ways to achieve a more confident self-image, as well as strategies to reduce nervousness during an interview. Taking the initiative to prepare for an interview can create new opportunities for career development in your industry. You can impress any employer by strategically anticipating the interview in advance. Our Interview Training Materials will help you master the interview process to advanced your career and give you the advantage for success!